Between The Billboards, by O.D. Pomery. These modestly-packaged, short minicomics come in drab cardboard covers that barely hint at the melancholy of the characters within. 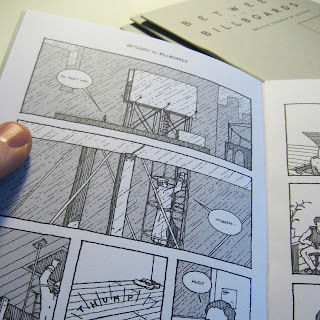 This comic is about a dramatic and vivid way of withdrawing from society, as a man named James Ebner lives in a small room he crafted between two advertising billboards in a city. The series is essentially several setpieces that get at the heart of why he withdrew, the potential for him to come back to society full time, and how living in total isolation and at a great height influences his thoughts regarding oblivion. The first issue sets all of this up as a kind of man between the margins, unnoticed by most. 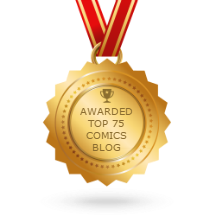 The second issue sees an old friend try to talk him out of his solitude, to no avail. The third issue sees James wandering the streets, reminiscing about a particular girl left behind and trading barbed quips with a friend who works at an all-night bowling alley. The fourth sees him confronting death and loneliness after a friend dies, flashing back a bit more to that woman who was so uninhibited where he was so unsure of himself. Pomery's drawings are crisp and precise, making great use of both negative space and geometric patterns, especially when trying to create a vertiginous effect as the reader looks down a sharp drop. This is a somber, reflective comic drawn with skill and intelligence, and I'm curious to see how Ebner's story turns out. 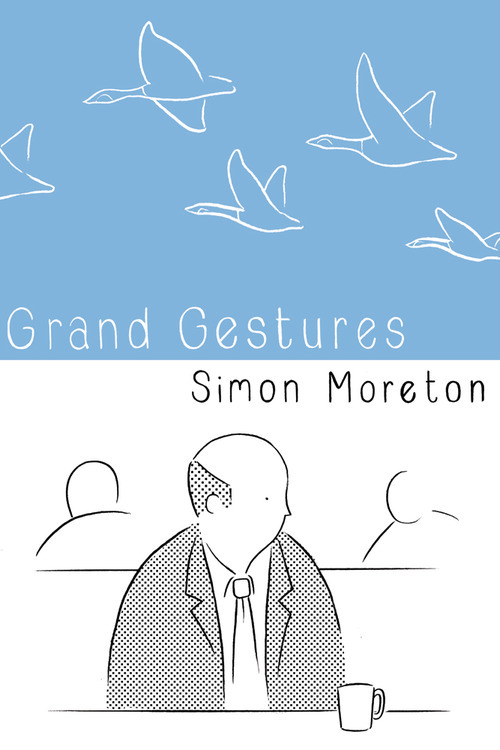 Grand Gestures, by Simon Moreton. Published by Box Brown's Retrofit, this new book by Moreton is absolutely lovely to look at, first and foremost. His evolving style of removing as many lines as possible is similar to what John Porcellino does, but the effect is much different. With John P, there's a sort of simple but firm structure that underlies all of his figures, landscapes and other drawings. They are stripped down to a kind of essence. With Moreton, he goes beyond that essence at times into the realm of figurative abstraction, recognizable only by dint of context. It's a kind of filter that goes beyond removing all but the essentials and into erasing some of them, creating a sense of stirring beauty on page after page. The story, which is told without words, follows a middle-aged man through walks around town and in a sales conference. There's some ambiguity here as to what the reader sees. Are we seeing what the man sees, what he wishes he could see or do, or some ghostly form of the man who is finally free (perhaps after killing himself)? When his body turns into a circle with a couple of loops trailing after it, it's almost as though he's a spirit floating around, but that could be him imagining himself floating freely on the breeze, freed of the dullness of his daily life. It's telling that we don't see the man in the final chapter after he seems to fly off with a flock of geese, and instead we only see busy city streets and people walking before Moreton pans back to an image of a single bird in the sky. 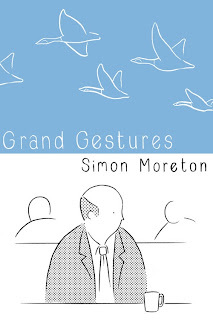 Once again, Moreton offers no explanatory details, making the images all the more haunting and yet uplifting, because those images of freedom are peaceful ones, especially for a man who seems to be living a life of "quiet desperation". 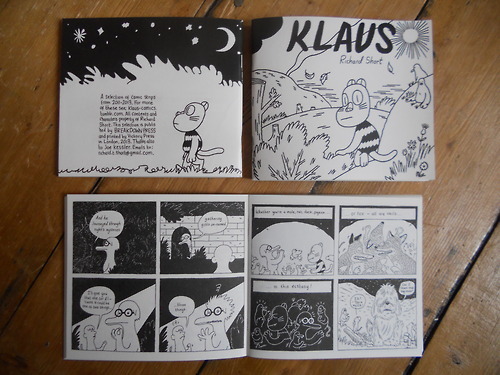 Klaus, by Richard Short.The Charles Schulz influence is obvious in these strips, from the introspective nature of many of the characters to its overriding sense of melancholy. With the little rat creatures who otherwise look like humans and the strip's generally earthy and occasionally vulgar sensibility, there's also a bit of the sensibility of Jon Lewis' True Swamp. Finally, the frequent lack of punchlines and drifting nature of the character interactions reminds me of Glenn Dakin's comics. While Short's influences are clear, he quickly transcends them to create beautiful, funny and thoughtful comics about topics like music, dreams, loving and nature. Short's figures are simple, crisp and cartoony, which sets them off nicely from his lovely and more detailed drawings of nature. Indeed, the pastoral quality of these strips adds to that sense of contemplative longing that pervades it. At times, the strip is also wickedly funny, like when a favorite strip is sold, the scandalous nature of insects is eschewed as an example of virtuous living, or when a smoking squirrel flat-out admits that he doesn't like jazz. Even an attempt at suicide has a funny punchline. This is really excellent work and is highly recommended for readers who like their humor mixed with poetry. 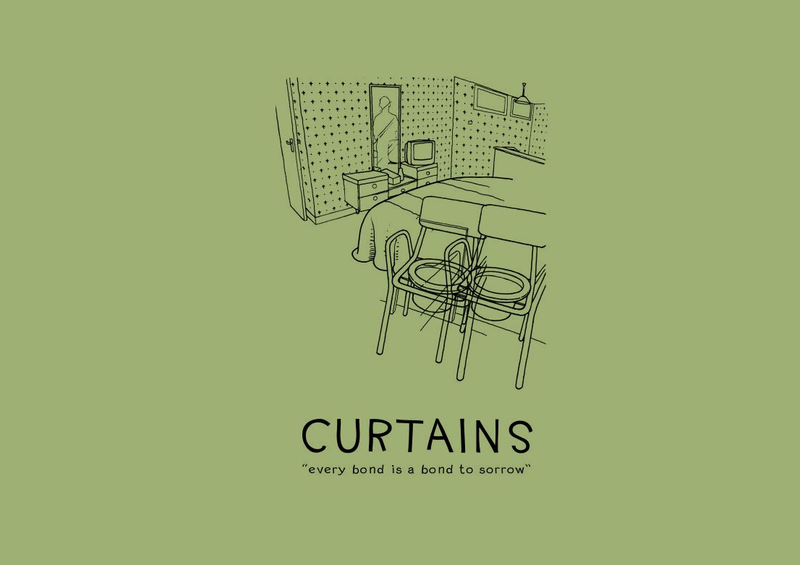 Curtains, by John Robbins. Robbins has really refined his pitch-black sense of humor and interest in the ways in which people think about and deal with death. The title story is about a sort of OCD man obsessed with his dead mother's obsession with telling him to close the curtains before turning on the light. The story deals with the way the narratives and voices of others seep into our consciousnesses Far crazier and his most ambitious story to date is "The Heart Bowed Down By Weight Of Woe". It's drawn in a clear and even cartoony style, which makes it a nice counterpoint to the darkness of the humor within. The story has two narratives: the death of the ailing father of a family and how reluctant his wife is to do anything about it, and the relationship between his son and an odd woman obsessed with a missing child. The mother character flatly states what a relief it is that he's dead, considering his nature as a tyrant, hilariously imagining that his obituary would focus on how long-suffering she was. The increasingly uncomfortable joke in this story is that she keeps making up excuses not to call an ambulance or deal with his dead body in any way. Of course, his son Tom is a misanthrope who can't be bothered either. As we learn about what a socially inept misfit he really is, the reader can't help but wonder how he managed to get a girlfriend, especially one as sweet-seeming and caring as Wendy, who scours the countryside in an effort to find a missing child named Mary. As the story proceeds and Wendy becomes creepier and creepier, Tom is mostly oblivious to her behavior until being confronted with it in a funny and unsettling scene with a neighbor who tells Tom about Wendy's dark past while trying to get him to agree that pedophilia is something everyone is interested in. The cheerfulness with which Robbins depicts all this is both dissonant and a big source of the humor. Robbins has always been fond of dramatic, horrific twists in his stories, but now he's balancing them with restraint, humor and a real sense of humanity, twisted as it may be.